11/9   L  0-27        Brickley's Naval Transport, Hoboken, at The Polo Grounds, N.Y.
11/16   ? Camp Merritt (H)  11/15? at Asbury Park? 11/28  T  0-0         Fort Hancock Sandy Hook Ordinance Dept., at Romson Country Club, Red Bank, N.J.
11/29    ? at Fort Totten  10/29? 11/2   L  6-12     at Fort Hancock  6-13? 0-14? 9/27   L  0-28     at Fort Totten  0-20? 10/11  W  6-0         Fort Hamilton (H)  ??? 10/18    7-33      at CedarBrooks, CedarBrook Park, Plainfield  6-32? 11/20  W 32-6      at Fort Howard (Baltimore, Md.) "8th win"
11/19  L  0-30    at  Army Medical School, Carlisle Barracks   30-0???
. no game        Rutgers J.V. 11/25  L  6-12        Leonardo F.C. (H)  6-13?
. W 38-0         Bloomfield A.C.
11/8  canceled        Indiantown Gap M.R. Team disbanded because too many players transferred out of base. 1949  (7-3-0) coach- Bill Vin Lenten  [1st Army champs]  pos. 8-3-0, win over "service team"
10/7   W              Camp Kilmer (H) (L? 10/28  W  6-0      at Trenton Teachers  [43rd straight without a win, NCAA record at time, 0-39-4 since 1938] 10/29? 9/25   L  6-20        Camp Le Jeune (N.C) (H) (night)  7,500  9/19? 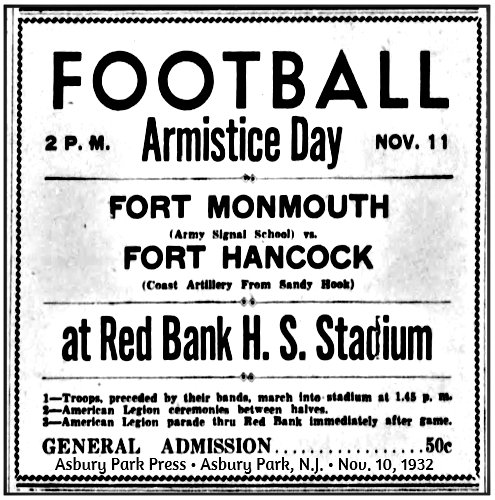 11/25  L  7-40     at Quantico Marines, Butler Stadium, Washington, D.C.
10/29  W 26-20     at Fort Dix  5,000  10/30 ? 11/28  L  0-34     at Quantico Marines, Butler Stadium, D.C.
9/21   L 13-14     at Anacostia Naval, at Washington, D.C. Note: 6 man intramural football played from at least 1949 through 1970s. �Near site of Battle of Monmouth Courthouse, Revolutionary War: The last battle of that War of Independence fought in the north June 28, 1778, although inconclusive, it proved that the Continental Army could fight the British on equal terms. This is the battle where Molly Pitcher took over for her downed husband in aiding the troops. �Civil War camp for mustering departing troops. �The U.S. Army Signal Corps began March 3, 1863. �Opened as Camp Little Silver June 17, 1917. �Renamed Camp Alfred Vail September 17,1917. �Alfred Vail (1807-1859) from Morristown was the inventor of Morse Code. �Bred and trained carrier pigeons and passenger pigeons for and after First World War. Relocated 1943 to Camp Chowder, Maryland, the birds returned in 1946. Served in Korean War as well, the pigeon program lasted to 1957. 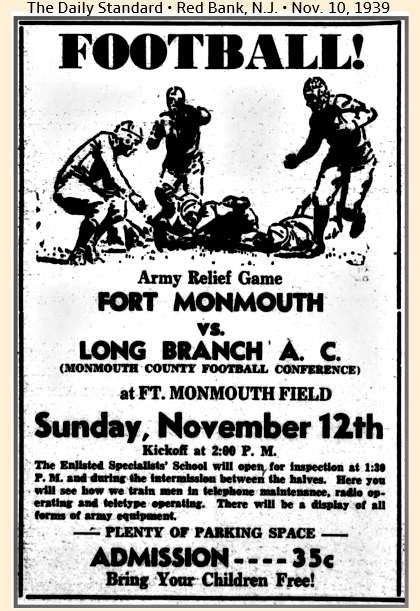 �Fort Monmouth Signal School opened 1919. �First radio controlled weather balloon launched from Ft. Monmouth. �In 1946, radar was bounced off the moon from the Diana Tower at Fort Monmouth. �Satellites from the earliest Vanguards (1958) developed here; night vision glasses (1968); Defribrillator Pacemaker (1972); laser rangefinder & lithium batteries (1974) among many other inventions out of the Fort. �U.S. Army Chaplain Center and School (USACHCS) moved to Ft. Monmouth from Fort Wadsworth 1979; transferred to Fort Jackson, S.C., 1995. �Currently home to U.S. Army Communications-Electronics Command (CECOM) from 1973), Army Materiel Command (AMC from 1962) and U.S. Military Academy Preparatory School (USMAPS), AKA West Point Prep, established 1946.